ABILITY: It looks like a crystal shard. "It allows you to accelerate without having to overstuff your decks with unnecessary pillars." If they were truly "unnecessary" then why one earth are they in your deck? They are necessary, is why. That is, they are now, with this card, they wouldn't have to be anymore, though.This is a card, that if put into the game, everyone would have to have. But, this is just my opinion. I do like having a new shard, but this one just seems to universal. There isn't a deck scheme out there that couldn't/wouldn't use this card. Why would I even use pillars? Six of these could net me 18+1 a turn. This card could work though. Say, if it was reduced to giving... well, what a pillar/tower already gives. 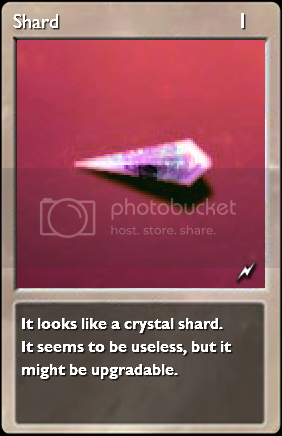 I think this card would be better using your other idea, make that idea a shard. This would be stronger than pillars, thus OP. No cards, no matter how rare, can be DEFINITELY better than other cards. Rarity isn't a way to balance cards. This card generates 2 quantum of your mark at the end of your turn and deals 3 damage to you. This might be more balanced. 6 of them = 12 quantum per turn at a cost of 18 hp per turn. Overstuffing is a gamers term refering to adding more of something than required for the late game. Pillars are truly necessary for a deck especially because this card particularly only produces quanta of your mark. It can in no way produce any quanta outside of that fixture. Only having six in your deck when they do not come to hand during the mulligan effect and a cost of 1 to deploy, means none on the first turn. 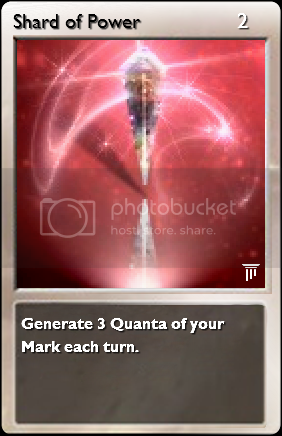 You still have to run quanta pillars or towers but this allow you to pull back your final limit in your deck by about 3:2 so replacing 6 pillars matching your mark with 6 of these you could also pull out 3 more pillars. and still get the same endgame production. Shards are designed to be Universal and work in any deck. As the Harmonic pillar, this shard would have no benefit some decks. I agree rarity is no balance for power, I can send you the various times I've quoted it. Actually it depends on the environment wether this card is better than pillars and mathematicallly it isn't overpowered. If you give me a deck design I'll do a calculative to show you. Also, try this (http://elementscommunity.org/forum/index.php/topic,658.0.html) with 6 Towers replaced by SoP's. I have to grab a Train soon so will have to do this Later, if anyone else wants to show a deck please do and I will do the lot in one table when I get back. 6 SoP, 2 Fahrenheits, 6 Fire Lance, 16 Fire Towers, Mark Fire. Pretty strong here, though I don't particularly care for the nerf above. Since the blue shard is a spell and green shard a permanent, I think the red shard should be a creature. I've already made a "Shard of Sacrifice" before, but it was a bit too complex. Also, right now the two shards have abilities revolving around HP. I think the red shard should involve HP as well. Hmmm... now that you mention it, I agree. A 3rd shard should be a creature. gain life+maxhp when this creature dies? Heal all your creatures each turn? Instead of doing damage he heals you for an amount equal to his power? N = Your life divided by 20 rounded up. This would make him a 5/5 for 4(Too powerful?) normally, but when used with stoneskin/shard of divinity he would have the capacity to be as large as a 26/26 creature. I think a black shard was already suggested that did something like that. Your opponents max hp is set to equal their current hp.